Next post: New Stamps Bring Me Joy! Dina Wakley’s Out of the Journal challenge has been making my head hurt. It’s not her fault. It’s me. Is this a canvas or an art journal page (just not in a journal)? I’ve pondered (which lead to the head hurting) how I would define art journaling and the answer that is best for me is art where I journal my emotions. 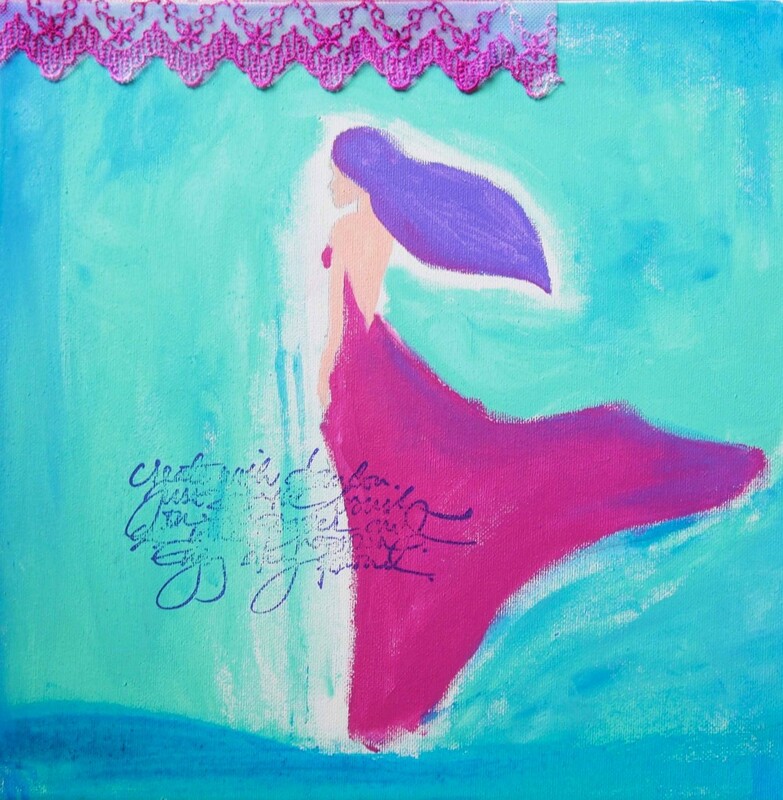 With that definition I would consider this canvas art journaling. Granted, it’s art journaling that hangs well on a wall. Do I use words to journal my feelings. Sure. But not always. I was feeling a bit stressed so I wanted paint on my hands. I had the most wonderful green & blue paints stuck under my fingernails from the background. 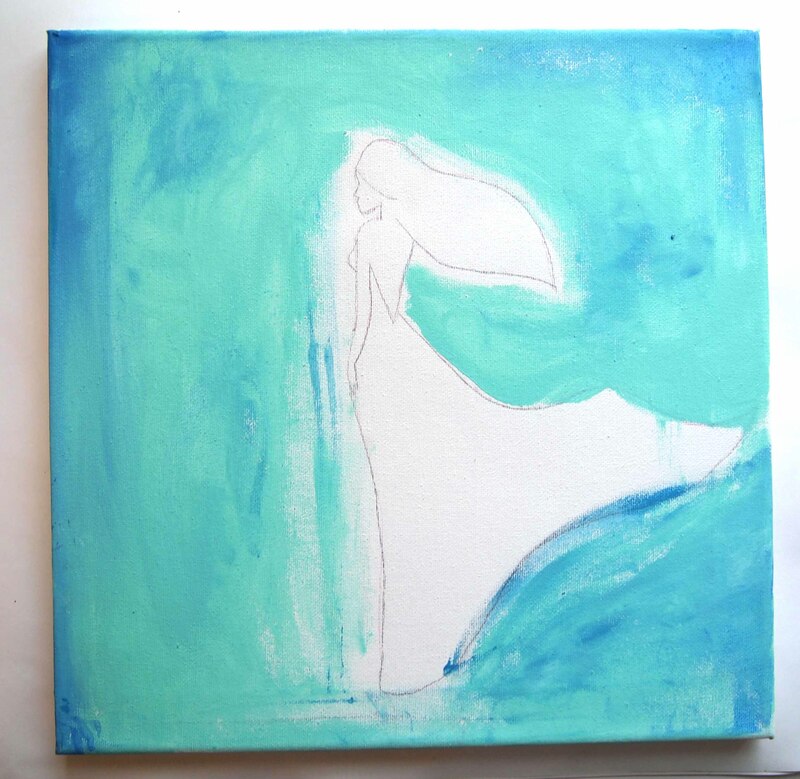 My feelings were vital in why I chose that color – I wanted a happy ocean color that would lead me to a better mood. Oceans and beaches are my happy place. I wasn’t sure what I was going to do with the girl in the middle so I just went “near” her carefully with my fingers full of paint. I didn’t trust myself not to get paint on her in most places so I left a bit of white. I was sure I’d come back with a brush and touch that up. Never did go back. I liked the white around her. She wasn’t turning out the way I expected but it was turning out better than I envisioned. Life lesson- make a plan and then stay flexible as it unfolds. A reminder that most of the stress I needed to release with the finger painting was my own creation because I was not staying flexible. No matter what I am working on- art journal, canvas, or something else – I am happy when my hands are covered in paint. Be sure to stop by Dina’s and see what everyone’s doing for their Out of the Journal Challenge! Want to see more paint? Check out all the goodness at Paint Party Friday! Want to see more art journaling? Check out Art Journal Every Day! Gorgeous! LOVE the colors…and the white! I must confess- she was drawn once and then traced over and over. She is actually on quite a bit lately- just haven’t had time to post it all. Ohhhh… I like her with the white around her. It’s like she is wrapped in contentment. The white space around your girl gives her an etherial, almost floating effect to my eyes. Stunning piece of Art. Journaling. Canvas. These sure are happy, summer-y colors! I love the way her dress floats on the wind, and the white space around her really makes her stand out. Beautiful journalcanvas. Lovely lady. She looks so dreamy to me. Beautiful. I like your flexible approach and movement in the picture. I am too detail oriented and it is stifling; maybe it is like my personality….hmmm. Anyway, love her freedom and the colors you used! I love the movement and colour in this piece! this is amazing work!!!! I love the lady you created and the colours!!! fantastic work…. Carolyn, this is just magical! While “digesting” your work before reading anything, I marveled at the aura you created by the white space around your image. I love that, at first, it was unintentional! While 99-44/100% of the time, I am moved most by the artwork and not the narrative in blog posts, I have to say that this post is one of those exceptions. I have copied down (and herewith ask your permission to quote you in my own art journaling blog): “She wasn’t turning out the way I expected, but [she] was turning out better than I envisioned. Life lesson–make a plan and then stay flexible as it unfolds.” This is just such remarkable advice! Very nicely done. I like the addition of the words. I wouldn’t stress too much about whether it’s a journal page or a painting. It is what it is and it’s beautiful! Beautiful composition with excellent colors and shapes, yes, excellent lady, I like it. Hi Carolyn. Love your floating girl and the colors you used are awesome. Well done! Loving your work today Carolyn. The blues especially, so soothing! Happy PPF! I love your piece! The colors and the mood are both calming and invigorating at the same time. This is the first time visiting your blog, and I have to say that not only do I love the artwork, but your prose as well. I’m struggling right now with this challenge….when I make a page in my journal, it doesn’t matter, because I’m just playing, you know? But a CANVAS? Gah- that just adds pressure to make it a displayable piece! So, I think I’m just going to pretend that my canvas is just another page- I can always gesso over the whole thing and start over! Thank you for sharing your work! Lovely! I can totally see why the ocean and beach is your happy place – it is mine too – I love to be by the shore and those turquoise shades are just beautiful. I like the idea of journalling on canvas and you’re so right about making a plan and then allowing yourself to be flexible! I really like the way she is surrounded by white, by light! Love her windswept, casual feeling. I keep intending to join Dina’s prompt and even have a canvas started…..maybe I’ll just share the start, the WIP. Beautiful colors, Carolyn. I love the ocean hues. And like the others I think the white enhances the lady and makes her stand out more. I love her!!! The colors are all fantastic and the white is a glow surrounding her. Wow..she is exquisite..she speaks to my soul..and the colors are deeply stirring and magnificent!! Shine on..wonderful piece! Nothing ever seems to turn out the way I planned at the beginning! That’s okay, it’s what makes life so fun! Staying flexible is a good idea..if only I would follow it. 🙂 Lovely work. HPPF. It would never have occured to me to leave the white around her, but seeing it, I think it is just perfect. Much more interesting than if you had gone back and filled in, which is what I would have done. your happiness in paint definitely comes through. and i like the white around here… it gives her a kind of ethereal quality. very nice! Carolyn, your work is beautiful. I love the colors you used today and the way she seems to float. The ocean is my happy place as well. I love the shape of the girl and the placement of the words. I’ve only gotten as far as taking the wrapping off a canvas this month – LOL! But I do have a plan. that little bit of lace…a perfect added touch! Love this, it’s a simple design but imparts so much emotion! Love your work! A wonderful work Carolyn! I didn’t know that we can journal on canvas. I love your process and the way you just have fun. :) I hope you feel better! Love those colours and she is beautiful. Very reflective looking. 🙂 I like the white around her as well. Beautiful, I really like the white around her. The blue/green background is gorgeous! The way that you explain your process and self-questioning is very interesting. So often I go into a painting without really having a subject or outcome in mind. However, in the last year or so, here and there, I have stuck with more realistic objectives. Well, some of the time anyway. MayBE it is from 366 Daze and how I am digital fiddling with Gracie’s photos, or mayBE it is just my process and present-time progress. I enJOY so much when other artists share their inner dialogue and I think it has allowed me to listen more closely to my own! Such a beautiful piece. So inspiring! Stunning and so true, Make a plan and stay flexible!! You need a journal page with those words!! Love it!! Your girl is lovely – I really like the movement and the white space around her. Beautiful art on canvas. I am also on my way to experiment on canvas. Beautiful! Ethereal and determined at the same time. My dilemma is between languages. Do I art journal in English? Most of the coolest quotes don´t look good translated but then … it is not my native language. Do I journal in Spanish? But then … cool things are left out. I´m coming to terms with bilinguism but haven´t been able to use both on the same notebook yet. The lady on your canvas is beautiful, as is the scrap of magenta lace! Perfect frame for the focal imagery! It’s absolutely lovely and I’m so glad you were able to pour some emotion onto a canvas to be displayed proudly for all to see. I must say I just love reading about your process. Your words are like brush strokes and I feel like I’m right there in the studio with you staring at a blank canvas and trying to decide which color I want to be! I love your definition of art journaling and think this painting is a dream! I’m with you in that the beach just makes me feel so centered. May you have many ocean filled days.